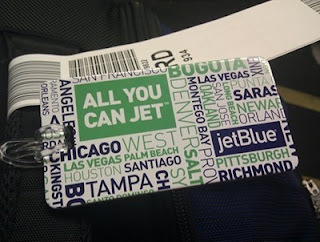 Last year, in 2010, I took off with JetBlue with my All-You-Can-Jet (AYCJ) pass during the month of September/October. I visited Boston, New York City, Los Angeles, San Francisco, and Denver. Five cities! Friends, food, and fun! It was such a fantastic journey! On my plane rides, I met many other jet-setters flying around the US. I remember having interesting conversations with them, and even on one flight, sitting next to a dog! Sadly, they’re not offering that pass this year. Instead, they’re offering the Blue Pass. Unlimited travel for THREE months. 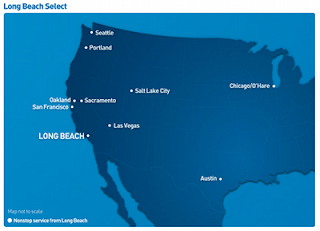 I chose to go with the Long Beach Select option. The cities available to me to/from Long Beach are: Seatle, Portland, Oakland, San Francisco, Sacramento, Salt Lake City, Las Vegas, Austin, and Chicago. So during the months of September, October, and November, I will be visiting some of these great cities. My goal is still to make it out to California and find a great job and live a good life chasing down all my other dreams. UPDATE (8/8/2011 6:44am): I bought my tickets last Thursdaay, August 4, and have yet to receive my confirmation email, which was supposed to arrive within 24-48 hours. I called JetBlue (1-800-Jet-Blue) yesterday (8/7/2011), and they told me that they are going to send me my confirmation email within 24 hours. They did give me a confirmation number over the phone, but I’ll feel better once I get an actual confirmation email, hopefully today. UPDATE (8/9/2011 12:53am): Still no confirmation email from JetBlue. What gives? I see the charge on my credit card. Why won’t their system send me a confirmation email? I’ll give them a call later on today. UPDATE (8/16/2011 3:22am): Logged into my JetBlue, and saw that I have my Blue Pass. Awesome.